It's hard to believe that I started this blog nearly a year and a half ago as of today. Witchy Words has come a long way from a small documentation of my spiritual life to reaching a much wider audience. However, over this time, one thing has remained constant: This blog is a labor of love for me. I do it because I love my religion, my spirituality and my practice, because I love the pagan community and because I love my inner circle of wonderful friends and family members. 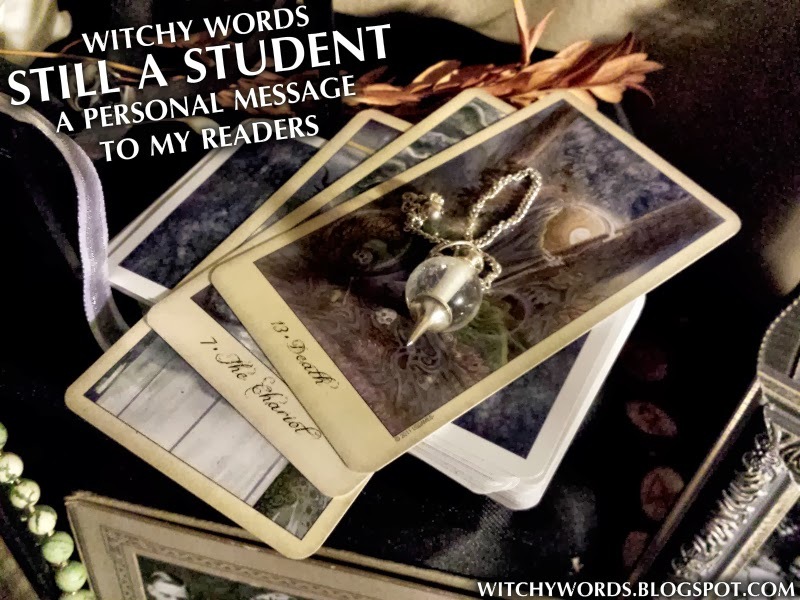 To that end, Witchy Words a collection of my beliefs, my experiences and the books and sites I have read to better understand my path. This has been an extremely helpful tool on my journey. I have grown more in the past year and a half from writing this blog and sharing with my readers than I have in the ten years prior that I've been pagan. I know I have a long way to go on my journey. I don't have an answer for everything nor do I entertain the notion that I know everything. I'm only 25 at the time of writing this in 2013 and my beliefs are still evolving. A spiritual journey is a life-long student experience. Anyone who travels the path knows that you are always growing. What I hope to achieve in my posts is the groundwork for someone to do further research. I am certainly not the end-all one-stop-shop for pagan, Wiccan and Witchcraft information; I'm still learning just like you are! I'm not a beginner, but I wouldn't consider myself an expert either. With that in mind, know that the information I post here is a collection of my experiences. It may flow against conventional beliefs. It may not work for you. Sometimes, it may go against everything you believe and that's okay. That's what makes our spiritual world so interesting - the number of unique paths that come together and share their thoughts. If you would like to talk about the blog or beliefs, I would love to do so. I am always looking for fresh perspectives and new books to read. If you feel I have made a mistake, I would like to know. I certainly don't want to come across as misleading, and the last thing I ever want to do is take my readers down the wrong path. Furthermore, I want to give my readers a huge thank you for the support, comments and blog boosts you've given me over the past year and a half. I owe my love of this to your kind words and stories. Some comments left by readers have reminded me that this is my calling in life - the one thing I was truly meant to do. I couldn't be more grateful. I actually discovered your blog yesterday, but I've been reading a lot of your previous posts (I'm at August 5th right now). You are exactly the kind of blogger I wanted to follow; not a teacher, but someone I could actually relate to through managing mundane life with spiritual work, someone who's humble and like to share her knowledge. I'm not Wiccan, but I feel like I'm learning about ways to practice, since I never really had any example how to do things. You make me wanna make a blog too, and even join or form a Circle. You wanna make me share my experiences like you do. Thank you for sharing your work, and keep up the good job with your blog. I love reading you. Thank you so much for your kind words, Maerviska. It's deeply appreciated. You should certainly create a blog and join a local Circle or Grove! The more you get involved, the more you learn. Best of luck on your journey! What is a Circle of Grove?